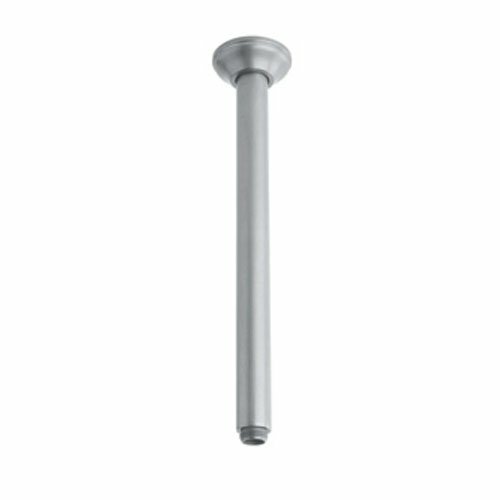 12" Ceiling Mounted Shower Arm Rohl 1505/12 Features: All brass arm and flange construction – weight: 3 lbs. Hand-machined from solid brass stock Superior finishing process – chemical, scratch, and stain resistant Shower arm length: 12-5/8" Adjustable wall flange 1/2” threaded male inlet, 1/2” threaded male outlet Designed for use with standard 1/2” U.S. plumbing connections All necessary mounting hardware included Two year warranty on manufacturer defects Manufactured in New Zealand, Western Europe, and/or North America About Rohl: Excellence, durability, and beauty. Family values, integrity, and innovation. These are all terms which aptly describe Rohl and its remarkable selection of kitchen and bathroom faucets and fixtures. Since 1983, Rohl has maintained a commitment to providing high-quality plumbing products for residential and commercial applications, while assuring these fixtures would make a difference in the overall décor in the living space. With a dedication to excellence throughout the home, Rohl has been satisfying homes, schools, hospitality venues, and restaurants all around the world. Rohl specializes in providing timeless designs for every type of theme, including traditional, transitional, and modern. When Rohl suggests its products reflect the feel of a certain area outside the United States, it’s more than just that. Rohl products are authentically crafted in towns in New Zealand, Western Europe, and North America .